David Poile has been the general manager of the Nashville Predators since day one. He escorted the expansion franchise carefully into the National Hockey League back in 1997 and for long stretches of time, the hockey world wasn’t sure they’d see ten seasons with a lack of stars and dwindling support. Since then though, he has quietly built an organization that has not only captured the attention of the entire hockey world but was recently recognized by ESPN as the top franchise in all of professional sports. Poile’s reign wasn’t always mighty. The organization went through stretches of public financial struggle, they missed the playoffs their first five years of existence and were recognized more for their putrid mucus colored jerseys than their success on the ice. It wasn’t until the 2006-07 season that an apparent business model approach shifted and Poile began going after notable NHL stars in what would be an extremely impressive run of talent acquisition that he has carried into the present day. The Predators soon realized their fanbase – like many others – had a thing for “A-Listers” on Broadway. Poile couldn’t have Garth Brooks running the powerplay or Carrie Underwood playing the wing (though she was a staple in her private box after husband Mike Fisher was acquired by the Preds via trade in in 2011) but what he could do was start filling a stable full of hockey stars. 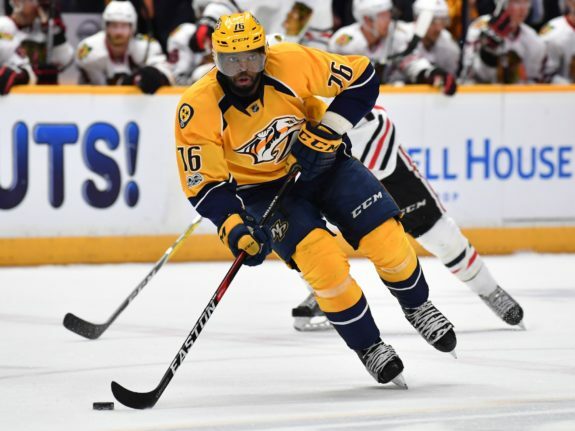 Names like Peter Forsberg, Jason Arnott, Paul Kariya, Shea Weber, James Neal, Mike Ribeiro, PK Subban and the previously mentioned Fisher brought their resumes to Bridgestone Arena and the fanbase came out in droves to see them. Building the number one franchise in professional sports requires an abundance of effective management decisions both on and off the ice. Coaching, drafting, ticketing, sales and marketing all play integral roles in a professional sport, especially in non-traditional markets like Nashville. Poile progressively assembled an off-ice staff that has clearly gotten it done but let’s focus on some of his greatest player acquisitions via trade, free agency or the draft that will go down on his resume as difference makers. February 25th, 2004. Poile traded defenseman Timo Helbling to Tampa Bay for an eighth round pick. 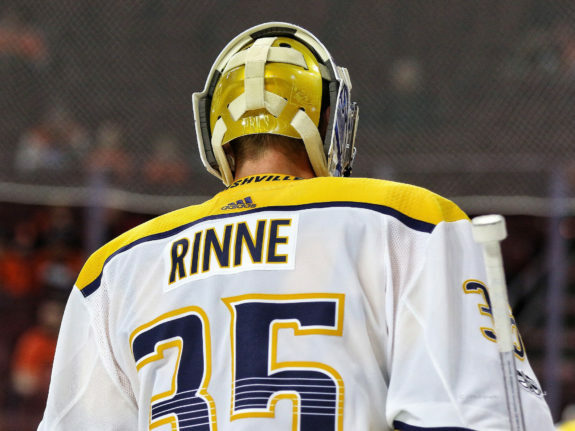 That late eighth round pick turned into Pekka Rinne. Late round draft selections that turn into superstars are always good stories and some may argue this wasn’t a masterful piece of work by Poile compared to some other moves like perhaps the Ryan Johansen for Seth Jones deal, but the pure impact this trade and draft combo has had on the Nashville organization cannot be ignored. Rinne is the absolute spine of this team and no conversation about a Stanley Cup would be taking place with the absence of his name. August 5th, 2005. Poile inked NHL superstar, Canadian Olympic Gold medalist and future Hall of Famer Paul Kariya to a two year deal worth $9 million coming out of the much maligned Collective Bargaining Agreement strike. Kariya had two wonderfully productive years in Smashville posting thirty goals his first and leading the Predators to their first one hundred point regular season. But it wasn’t his statline that makes this move one of Poile’s best, it was the principle of it. This was the first big splash the Preds’ had made in free agency and one of the first true NHL stars to call Nashville their home. It was a signal to the league and their fans that they were tired of mediocrity. February 10th, 2011. Poile flipped a first round pick to Ottawa that turned into Stefan Noesen – currently a fourth liner in New Jersey – and a third round pick that never played an NHL game for veteran center Mike Fisher. Fisher brought a culture of hard work, accountability and respect with him and instantly turned into the heart and soul of the team for the next seven years. He was a founding father of “Smashville” and his marriage to country-pop megastar Carrie Underwood merged the Predators with their city’s heritage so to speak for years to come. June 29th, 2016. Kaboom! Poile pulls the trigger on the largest trade the NHL has seen in years. Sending fan favorite and rocket launching captain Shea Weber to the Montreal Canadiens for superstar PK Subban. Subban arrived on Broadway with his larger than life personality, his uber mobile style of play from the backend and anchored one of the top d-core’s in the league. Weber is no slouch in Montreal, still a top tier NHL player who produces and Canadiens brass still swear the trade was in their best interest, but Subban is a 28-year-old still looking to be in the prime of his career and has propelled the Preds into the NHL elite. This move displayed sheer daring prowess from Poile who wasn’t afraid to make a big move involving one of his established stars to gain a big return and in the months and years since this trade, Subban has validated his GM’s vision by his impact on the team and their fans. 1 – Stick Em’ Up Boys! April 3rd, 2013. You know what’s coming here right? Poile shipped forwards Martin Erat and Michael Latta, neither of which are still in the NHL to Washington for Filip Forsberg. Erat went on to score two goals – yes, that’s not a typo, TWO – in his Capitals career while Forsberg is at 106 and counting as the Predators top forward for years to come. “If we were going to trade Marty, we needed a big return, because in all likelihood, when you’re in that position, you’re going to get a young player or prospect or pick. In other words, you’re taking arguably our first-line winger off our team for something in the future. So it’s clearly a step backwards to hopefully someday go forward.” Poile Told Matt Larkin of The Hockey News back in 2013. Poile’s hopes of going forward after that trade have surely been met as Forsberg develops into one of the NHL’s young stars. He probably should have been wearing six shooters and a bandana over his mouth when he rode out of town after stealing Forsberg from then Capitals general manager George McPhee and this move will go down as not only one of Poile’ best ever, but one of the most lopsided trades in recent NHL history. 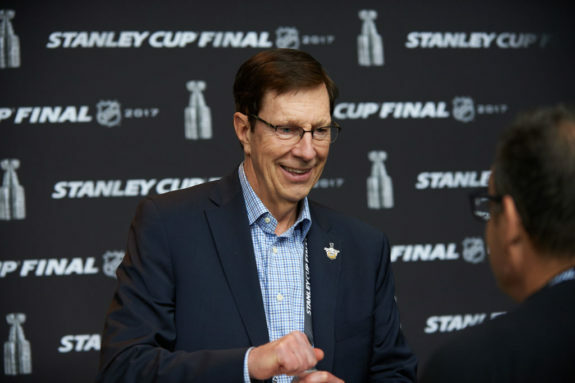 Is Poile one of the best general managers of this decade? Hands down. His peers agree as they voted him the 2017 General Manager of the Year at the NHL Awards last season. His player acquisitions that have continued to bring star talent to the Nashville fanbase, his orchestration of the salary cap to always be in the conversation on new deals and the fruition of many past deals has put his team smack dab in the middle of the Stanley Cup conversation. Will his mastery continue approaching the 2018 trade deadline or is it time for Mr.Poile to sit with the rest of the Broadway stars and watch this current group make a march to a championship.